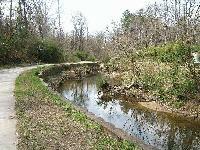 10" wide paved trail through open meadow and wooded floodplain. the Length is .8 miles. The trail connects adjacent neighborhoods to Eastgate Shopping Center and Linear Park. There is limited on street parking. Hours of Operation: 6:00 am until 30 minutes past sunset.